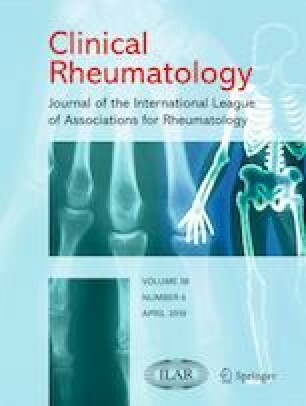 To describe the prevalence and distribution of clinical and ultrasound (US) pathological findings at ankle level and to compare them, in patients with rheumatoid arthritis (RA). This is a descriptive, cross-sectional study assessing patients diagnosed with RA according to the 2010 ACR criteria, who were recruited consecutively and independently of disease status or treatment and of the presence of pain at ankle level. Clinical and US findings were acquired by two independent rheumatologists. US assessments were performed according to the EULAR and OMERACT indications. A total of 224 ankles of 112 RA patients were examined. One hundred (89.3%) patients were women and 12 (10.7%) were men, with a mean age of 51 years. RA mean disease duration was 72 months. Ankle spontaneous pain was found in 56.2% of the patients. In 65.2% of the patients, US found at least one pathologic sign indicative of joint and/or tendon pathology. Using grayscale US, joint involvement was more frequently found than tendon pathology (37.5% vs 22.3%). Conversely, no substantial difference was found between the prevalence of power Doppler signal at joint and tendon level. There was a significant correlation between clinical findings and US findings indicative of tibiotalar joint synovitis and peroneal tenosynovitis. In the present study, pain and US pathologic findings at ankle level were described and compared in a cohort of RA patients. Spontaneous pain was found in more than half of the patients and US found joint involvement more prevalent than tendon pathology. All the authors declare no conflict of interest for this manuscript.